From ancient Egypt to present day, human beings have crafted written symbols for the purpose of simply and elegantly representing information. As we have progressed into the digital age, we still use symbols (I believe to an even greater degree) to express and identify common actions and ideas. When we encounter any one of these symbols we often don’t even consider their origins. They become so associated with the idea that they represent, we lose the story of where they came from. Well, this particular infographic looks to demystify a certain sect of of these symbols that we use – User Interface symbols, or UI symbols. Take for instance, the power button. We see this symbol everywhere. From starting a Toyota Prius to powering on your computer, this symbol of on/off has its roots tied all the way back to World War II rotary switches, toggles and power buttons. In binary, the symbol 1 was used to represent ‘on’ and 0 conversely meaning ‘off’. In 1973 the International Electrotechnical Commission codified the image of a broken 0 with a line (or 1) through it as a ‘standby power state’. This was later altered to mean simply ‘power’ and has been used worldwide ever since to symbolize this. 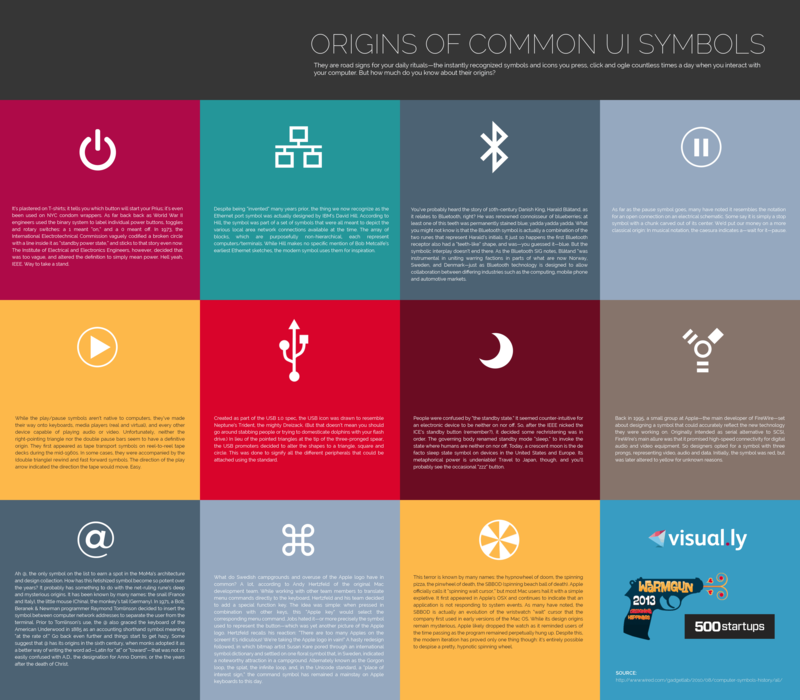 The rest of the infographic similarly and succinctly describes other UI symbols and their origins quite well. Enjoy the lost stories of the symbols on our machines.